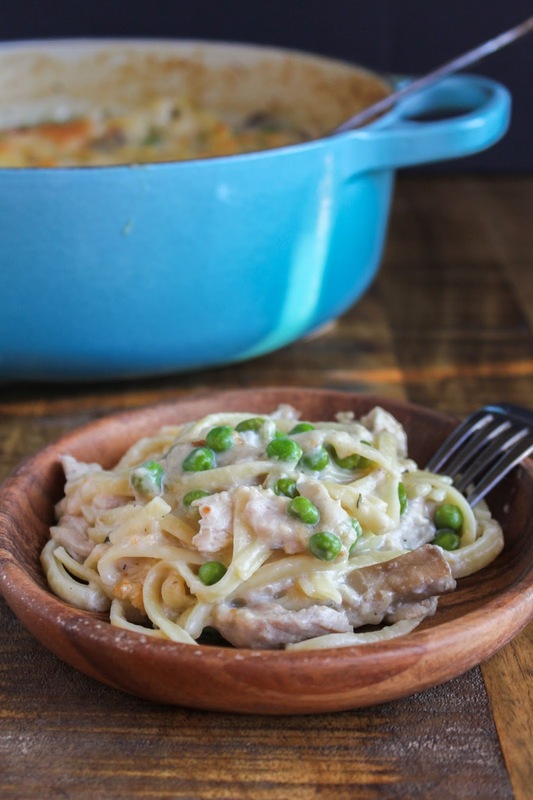 Creamy Herb Chicken Tetrazinni one of your new favorite go-to meals! Now that the weather is cooling off I'm all about comfort food again. Spring and summer it's all about eating light and fresh, but fall and winter I'm ready for my favorite soups, stews and casseroles. Are you with me on this? I think so far I've already made two batches of chili, meatloaf, and creamy tomato basil soup, and it's just mid-October! Clearly I'm welcoming fall with arms wide open. 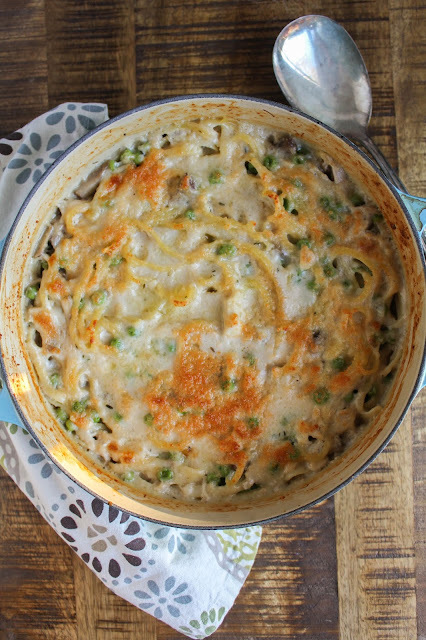 This creamy dreamy herby chicken tetrazzini is the epitome of comfort food. An easy homemade cream sauce full of fresh Parmesan cheese, delicious shredded chicken (from a rotisserie which makes it so simple! ), and pasta. Three of my favorite things in one dish! AND the whole meal can be made it less than an hour. What's better than that?!? October is actually National Pasta Month, so this recipe comes at a perfect time. 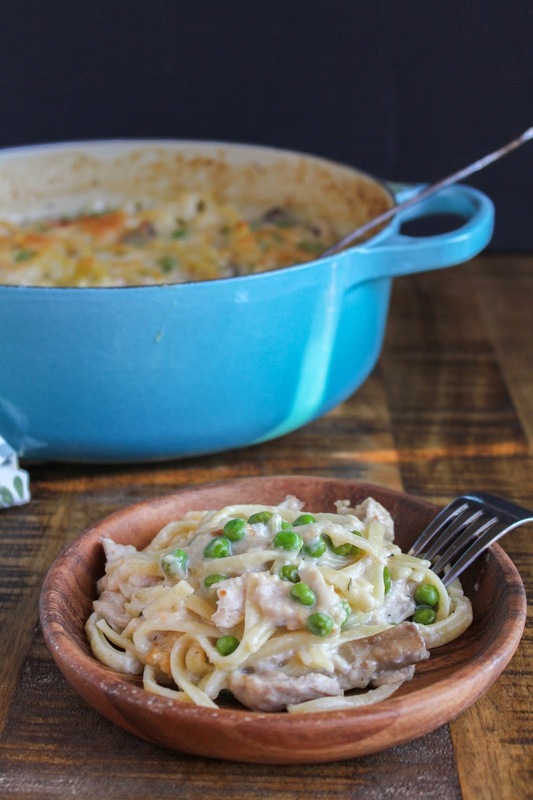 Comfort food and pasta go together perfectly in my book! Grab the ingredients for this dish and make it soon. I know it will quickly become a favorite in your house, just like it is in mine! Preheat the oven to 400 degrees. Bring a large pot of water to a boil for the pasta. In a Dutch oven or large saucepan, melt 2 tablespoons of the butter over medium-high heat. Add the mushrooms, season with salt and pepper, and cook until tender, about 10 minutes. Transfer the mushrooms to a plate and set aside. In the same Dutch oven, melt the remaining 2 tablespoons of butter over medium heat. Add the flour and cook while whisking for about 1 minute. Slowly add the milk and broth, whisking constantly, and bring to a boil. Reduce to a simmer and add 3/4 cup of the Parmesan cheese and the dried thyme. Season to taste with salt and pepper. Add the peas to the sauce and cook for a minute or two before adding the shredded chicken. Mix well. Cook the pasta according to package instructions, pulling it out 2 minutes early for al dente. Add the pasta to the sauce and toss well to combine. Sprinkle the remaining Parmesan cheese over the top and bake until browned, about 30 minutes. Let stand 10 minutes before serving. I'm proud to partner with the United Dairy Industry of Michigan and I thank them for sponsoring this post! I was compensated for developing a Pasta Party recipe and, as always, all opinions are my own. UDIM, branded as Milk Means More, is the umbrella organization for the American Dairy Association and Dairy Council of Michigan. Their goal is to promote Michigan’s locally produced dairy products and reconnect consumers with the people behind their food.